When you last sowed seeds did you make sure the seed starting mix had been sterilized? How about the container you put it in? Did you make sure it was clean, too? And lighting? Did you pay attention to whether the seeds needed light or dark to germinate and adjust the light accordingly? Soil temperature? Did you get a warming mat to make sure that the soil wasn’t too cold? Of course you paid attention to watering, too? Not too much and not too little? And did you make sure the seeds were planted at just the right depth? Those tiny seeds, like petunia seeds, sure seem difficult to sow and grow, don’t they? 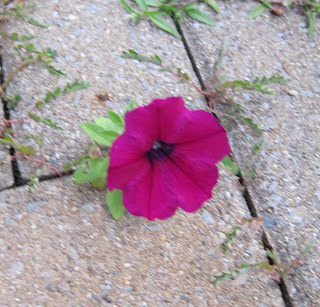 A petunia is growing in the cracks of my patio. I surely didn’t plant it there! It sprouted from an errant seed that came from who knows where. With no soil sterilization, actually no soil to speak of, no special container, no regulated temperature, no precise watering and whatever light the sun decided to shine upon it, this petunia seed germinated, grew and flowered. Seeds will germinate and plants will grow even and sometimes especially without a gardener trying to control everything around them. Our role as gardeners isn’t so much to provide perfect conditions for all the plants we grow but to just bring a little order to nature. That’s the lesson of the petunia in the patio. I have a gravel walk that is a seed starting bed. I do nothing and it produces. Some of my best plants grow in the cracks in the driveway. Wish they'd grow that well in my beds. Nice petunia you've got there, Carol, don't forget to deadhead when the time comes! It seems there is an abundance of volunteer plants in the blogosphere this year. Nature knows best! What a lesson from the Petunia..
Lovely burgundy! I had a electric purple one pop up in the front garden. I've never had a purple petunia planted. I think the birds left me a present! Hooray for volunteers! My Grandpa Ott didn't self seed in a patio crack; it grew in the dark and sand below our Welcoming Platform and is finally blooming in the sun. I have a Columbine that seeded itself in the crack between the house and the sidewalk. Tried to pull it up last year when it was small, the roots didn't let go. This year it is pretty big. Can't imagine what kind of long roots it has to get to some nutrients. I love the volunteers, they are the true survivors! I've purposely seeded my patio cracks - it's a great way to keep down the weeds and to add in even more plants when you've run out of space in the beds! Small, delicate-looking plants are best (anything too tall will look out of place, and you'll end up having to goose-step over them! ), and you need to use seeds which can be sown direct. Alyssum and Lobelia are my favourites for my patio cracks at the moment, although I'm also experimenting with thyme and camomile. So true! Last year I was admiring everyone's goldenrod cultivars, when lo and behold, I discovered I had my own goldenrod--the native kind--growing all over the farm, including through a crack in the concrete around the fuel tanks! When I was a kid, my mom used to sing an old song with the line "I'm a lonely little Petunia in an onion patch." I'm sure it got there the same way that Petunia got into your patio. Yeah, and once they have sprouted there in the cracks they are almost impossible to transplant somewhere else. It's maddening. At my old house, I had alyssum growing in the tiny crack between the house and the driveway. It always made me smile. I have at least one volunteer petunia, several volunteer nicotianas and a whole bunch of verbena bonariensis every year. I hate to pull them out. My mother-in-law had a similar experience — also with a Petunia! Such a tenacious little plant.